Desk research on the European reality shows that post-war neighbourhoods are deteriorating and experiencing livability problems. Livability is a complex term since it relates to a wide range of aspects, including the idea of “quality of life” as that of “well being” (Nieboer, 2005). More specifically, community livability is the environmental and social quality of an area as it is perceived by the people which live in it. It includes concepts such as safety and health, environmental conditions, the quality of social interactions, and opportunities for recreation and entertainment (Victoria Transport Policy Institute, 2010). Decline processes in neighbourhood livability offer certain similarities. Several European areas, in fact, are no longer considered attractive living environments and have lost their competitiveness at city level. Such problems arise especially in post-war suburbs which represent a large part of the total housing stock in Europe (Andeweg et al., 2007). In this context, in the Toledo Declaration the European Union member States stated the need for more liveable and sustainable neighbourhoods. The recommendations put forward include, among others, the importance of eco-efficient regeneration (i.e. water and waste management, land recycling and “re-greening”), of improving diversity in housing typologies and providing new and revitalized open spaces to make neighbourhoods more attractive (Council of the European Union, 2010). In Italy, the most deprived neighborhoods appear to be especially those dating back to the early sixties of the last century (Di Biagi, 2009, Acocella, 1980). Although it is difficult to draw a picture of the quality of Italian social housing suburbs we can, nevertheless, say that due to both lack of effective management and misuse problems livability is progressively decreasing. In the worst cases physical deterioration and abandonment are combined with antisocial behavior such as crime, squatting and vandalism. Since institutions often lack proper control, residents do not feel safe and social interactions are compromised (Calzolaretti, 2011, Carini et al., 1978). In the last twenty years, national urban policies directed to neighborhood regeneration have lacked coordination and continuity (Giofrè, 2007). Indeed, with just a few exceptions, the planning tools for urban regeneration recently introduced have led to partial and fragmented outcomes resulting in a need for new ideas and innovative strategies as well as for a stronger policy and well organized funding. In this context, how to support the renovation of public residential suburbs in Italy improving quality of life and sustainability? This is the main question that the research project, named Living Urban Scape (LUS) and supported by the Italian Government in collaboration with the IUAV University of Venice and the Roma Tre University (www.livingurbanscape.org), set out to answer. Nevertheless, ascertaining whether there is lack of livability is a complex task in which multiple factors at different levels should be taken account of and thus, the project decided to focus on the quality of open spaces which, alongside with the deterioration of buildings, mono-functionality, marginality and socio-economic depression, are among the most important issues in declining postwar social housing neighborhoods. Indeed, open spaces are often highly deteriorated, abandoned, insecure, used for illegal activities and wasted. In the LUS research project, unqualified open spaces are considered a strategic resource for neighborhood regeneration rather than just a problem. Three possible regeneration strategies directed to problematic open spaces are then investigated based on residents’ involvement: spatial (1), greening (2) and building densification design (3). In this context, the objective of LUS is to identify good practices in the redesign and management of open spaces based on cases study analysis and design experiments in problematic public neighbourhoods. It is expected that the above-mentioned strategies, which go beyond the simple redesigning of benches or gardens, could also stimulate social cohesion, innovation, improvement of environmental quality and attract public and private investors (De Matteis, 2010). Within the above framework, observing European good practices may lead to enriching the development of regeneration strategies in Italy. Therefore the present paper deals with the following sub-question: what key aspects should inspire experiments in deteriorated Italian neighbourhoods? To provide an answer we adopted a qualitative research approach based on case studies. We started with European countries with a high percentage of social housing on the total housing stock: the Netherlands (32%), United Kingdom (20%) and Sweden (17%) (OTB Research Institute for the Built Environment – Delft University of Technology and Ministry of the Interior and Kingdom Relations, 2010). Our research, however, led us to other interesting cases from additional countries, and we thus enlarged our overview to include Germany, Belgium and France. For the selection of case studies we consulted the archives of national and international awards and contacted local institutions in the respective countries (i.e. ministries, municipalities and housing associations). We prioritised integrated sustainable approaches (Riccardo and De Matteis, 2011). The case study analysis described here does not aim at drawing general conclusions for the European context but, rather, aims at extracting qualitative key aspects from foreign experiences which could possibly inspire future applications in Italy. Consequently, from the case studies we derived a number of elements that, according to our opinion and the aim of the research, deserve attention (Table 1). We summarized information on case studies in tables with pictures and arranged the most relevant elements in two groups: environmental and socio-economic, respectively named the “4D” and “4C” working principles for neighbourhood regeneration (Table 2) (De Matteis and Riccardo, 2011). The 4D principles include Diversification, which recalls the need for clear and diverse functions of open spaces. Indeed, as emphasized by several studies, it is important that such spaces can be clearly understood and distinguished one from another by the users. Legibility of connection and hierarchy of spaces are of great importance (Sendi et al., 2005, Alexander, 2004, Alexander et al., 1977). In many of the cases analysed, but especially in England, this principle is adopted within the partial privatisation of public spaces. Thus, declining spaces are converted into thematic parks, art installations, sport facilities or educational gardens as showed in Attwood Green, Lobeda West and Ekostaden. On the contrary, in the Dutch cases of Poptahof and F Neighboruhood, diversification is combined with a typological and functional mix of both open spaces and buildings, which effects their overall attractiveness, also in economic terms (van Altena, 2007) (www.poptahof.nl). Decrease of anonymity through diversification may be obtained by design competitions, as showed in Zukunftswerkstad, or by residents choosing themselves design firms and contractors, as in Angell Town (Figure 1). There are numerous types of open spaces among which are those for social activities that stimulate social cohesion. But what is clear from the research carried out is that scarce consideration is given to the provision of proper outdoor facilities (De Chiara et al., 1995 in Sendi et al., 2005). With this respect, a very important principle in the regeneration process of declining neighbourhoods should be the Dislocation of social spaces in the core of the suburb, a solution we found in most of the cases analysed. Offering liveable spaces to be used by diverse groups, different in terms of age or requirements in the use of space, and with an easily recognisable spatial character by the local community, appears to be an effective strategy. In Potahof and Angell Town, for example, the central, anonymous public space has been redesigned to be both a playground for children and a set of different parks designed for all ages (the Landscape Practice Group, 2010); in Iglo, instead, the core of the suburb is a new street connecting residential buildings with commercial and social facilities (van Altena, 2007) (Figure 2). We named the third and fourth principle Densification and Deconstruction referring to approaches specifically applied to buildings but which produce effects on open spaces. As it emerges, especially from the Dutch and English cases, increasing building density by filling deteriorated land with new construction contributes not only to recreate a more compact urban fabric but also to reduce the amount of declining surface usually difficult to manage and control. 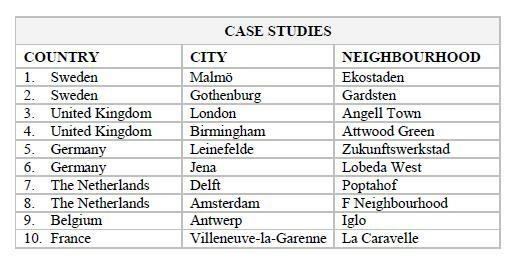 Reality shows that there is a general interest from potential investors for spare spaces to be used for additional construction (Sendi et al., 2005). In Poptahof and F Neighbourhood, for example, the building density is increased by adding new middle-rise blocks at the bottom of existing high-rise estates. In some cases, Densification obtained through new construction planning, considers the reorganisation of parking places in combination with the redesign of public areas. As showed in Poptahof, La Caravelle and Lobeda West, in fact, the surface of covered parking can be used as additional public space. On the contrary, as shown by the German cases, wherever residential blocks are characterised by a large building mass, it is possible to adopt, with interesting results, innovative dismantling techniques of building components. Prefabricated concrete elements are deconstructed and then either re-employed in new blocks or to renew public spaces (i.e. pavement). (Fig. 1 and 2). Such a recycle-reuse approach led to reducing the massiveness of large buildings and the amount of waste from demolition, with a clear environmental benefit (Kildsgaard et al., 2008) (www.worldhabitatawards.org) (Fig. 3 and 4). Clearly, a relevant principle in regeneration is Cooperation – of all the parties involved, both public and private, and active and continuative involvement of residents. But research has shown that real participation is seldom implemented in practice. Local authorities are often not interested and most residents develop a self-focused and indifferent attitude: “the boundary of my property is the boundary of my interest” (Sendi et al., 2005). However, most of the cases analysed, tend to point out that strong leadership and the presence of a group of tenants with a decision-making role are crucial elements for the successfulness of the regeneration process. For instance, the majority of the board of the Gardsten housing association, is made up of residents. Moreover, in Zukunftswerkstad, Poptahof, Angel Town, Gardsten and Ekostaden it emerged that constant communication between the residents and the parties involved as well as easy access to communication and an active organization of social activities are very important. The fourth principle relates to the Control of open spaces. In fact, for an external environment to be pleasant and provide a sense of place both buildings and open spaces need to be properly maintained (Caramona, 2001 in Sendi et al., 2005). Willingness to control might be stimulated if residents feel that they are attached to and own the place (Habraken, 1998). Control in Angell Town, for example, is provided by the residents themselves helped by the residential layout with front doors and openings directly on the street, overlooking outside spaces (www.neighbourhoodsgreen.org.uk). Despite of being very simple, this design solution, which fits especially compact urban fabrics, would stimulate residents to activate mutual social control. In Ekostaden care for open spaces is stimulated by a specific control program directed to the system of channels and ponds for storm-water management. A network of centres for waste collection, reuse, recycling and composting allows for the reuse of 89% of the waste produced (Kazmierczak and Carter, 2010). Last but not least, is the principle of Concreteness. In order to stimulate trust and credibility within the local community it is in fact necessary to adopt long-term investments on strategic areas that produce quick and visible results because long renovation processes may be considered as negative factors by the residents (Van der Flier and Thomsen, 2005). Moreover, visible actions may improve or create a local attitude. As in the case of Zukunftswerkstad, for example, visible and effective interventions led the residents to develop a protective attitude towards the environment and led to political stability. To provide an answer as to what are the key aspects that may inspire experimentation on deteriorated Italian neighbourhoods, we identified two groups of environmental and socio-economic principles for neighbourhood regeneration based on the case study analysis. We found out that clear Diversification in the design and use of open spaces, Dislocation of functions to the centre to create a core social area, housing Densification and Deconstruction of prefabricated concrete blocks to stimulate the building industry might be reference principles for livability improvement. Cooperation of all the parties involved driven by strong leadership and active involvement of residents, Creation of business and employment opportunities through construction works and open space environmental programs, rigorous Control and continuous management, as well as Concreteness of interventions for trust and credibility, appeared to be inspiring lessons as well. As we expected, parallel to the mentioned principles, we found that regeneration is mainly financed by local public authorities and housing associations. In some countries, national governments set out further funds directed to deprived neighbourhoods. On the basis of decline indicators, such as unemployment or quality of housing, England, France and the Netherlands organize a priority list of suburbs where public investment should be urgently directed towards regeneration processes. Such an approach, however, would appear difficult in Italy considering the fragmented housing policies and the lack of a strategic interest at national level. In the European cases observed so far, the support of the European Union comes especially from the European Regional Development Funds which, however, finance circumstanced and experimental projects. In any case, such a source should be considered for possible experimentations in Italy. With these preliminary conclusions in mind, which we will strive to complete with additional cases, we will proceed to select a number of Italian neighbourhoods in which to identify, alongside local authorities and residents, the existing opportunities to initiate a process of regeneration of deteriorated open spaces. Carini A., Ciammitti M., Farina R., Guidotti A., Lomi E., Massè Franco Nuti A. & Trebbi G. (1978), Housing in Europa. Seconda parte 1960-1979, Bologna, Edizioni Luigi Parma. Nieboer N. (2005), The disputable role of the built environment in liveability, ENHR conference Housing: New Challenges and Innovations in Tomorrow’s, Reykjavík.